Custom Mattresses. Made at Your House. 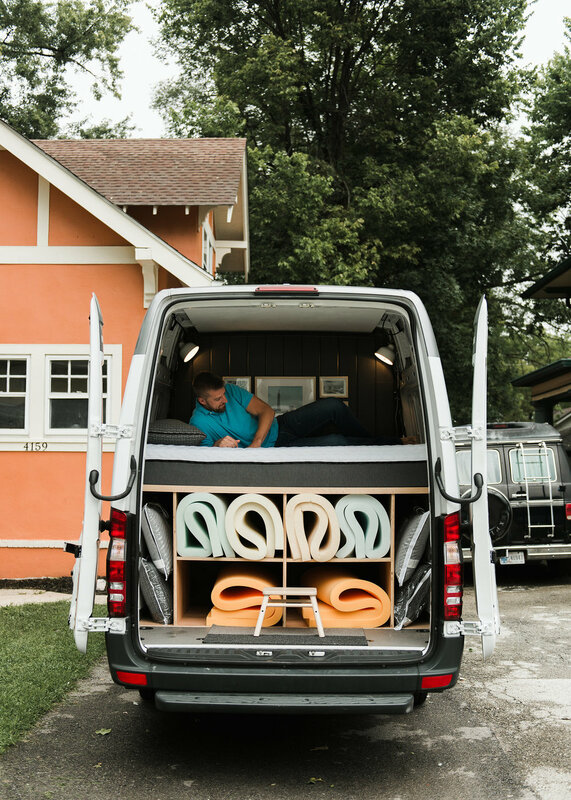 If you live in the greater-Indianapolis area, simply make an appointment and we’ll bring our mobile mattress showroom to you. You can test all of your customized mattress options in the showroom to find the perfect construction with the right feel and properties you’re looking for. Once you’ve found it and are ready to purchase, we’ll build your new mattress right there on the spot, using a blend of materials best-suited to meet your individual needs. 1. Take our quick, 6-question Comfort Test to begin the customization process. 2. Schedule a risk-free appointment at a time that works for you. 3. 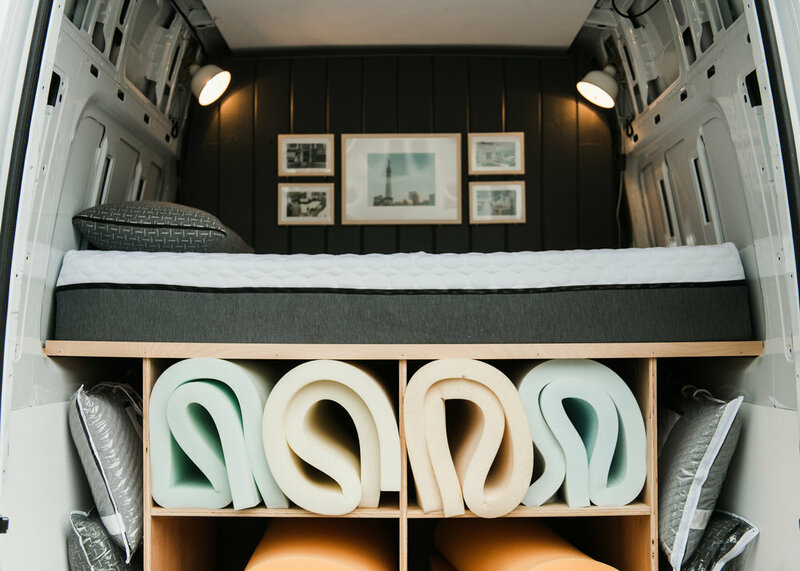 We bring our mobile showroom to you to test your individually customized mattress constructions. If you like it, we’ll make it for you right then and there. What to Expect? Take a Look. Click through to view our Store-to-Your-Door process from start to finish. Customized comfort is now easier and more convenient than you ever imagined. The Mobile Mattress Showroom, Brought to You. Once an appointment is set, we bring the mattress store right to your house, armed with dozens of potential mattress constructions. 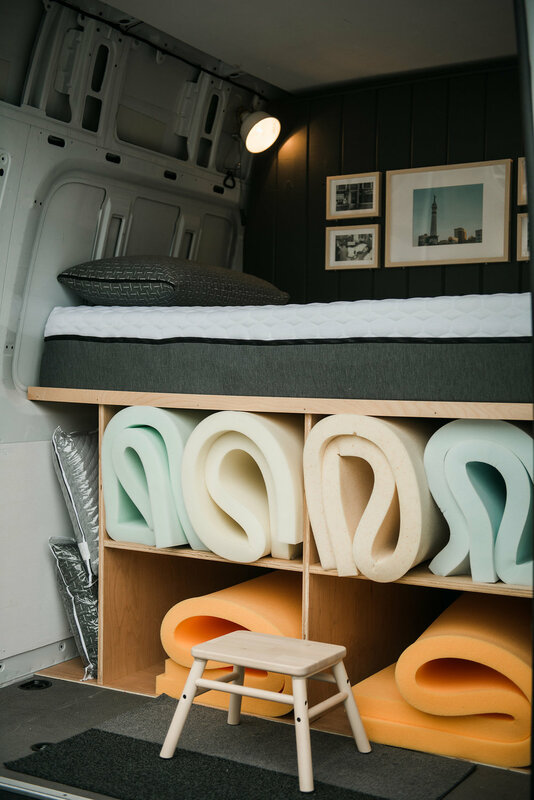 All of the foams you see rolled underneath the mattress (along with two others that are already inside the mattress) are options for customization. Each foam brings different benefits - pressure relief, support and bounce, cooling, and more. You can try as many combinations and constructions as you’d like until you find what’s absolutely best for you. In just six questions, we find out more about who you are and what you need to improve your sleep. The answers to these questions create suggestions right on our website for mattress constructions that will work for you. This gives us a starting point in the customization process. If you share your mattress with someone, you both get your input heard. 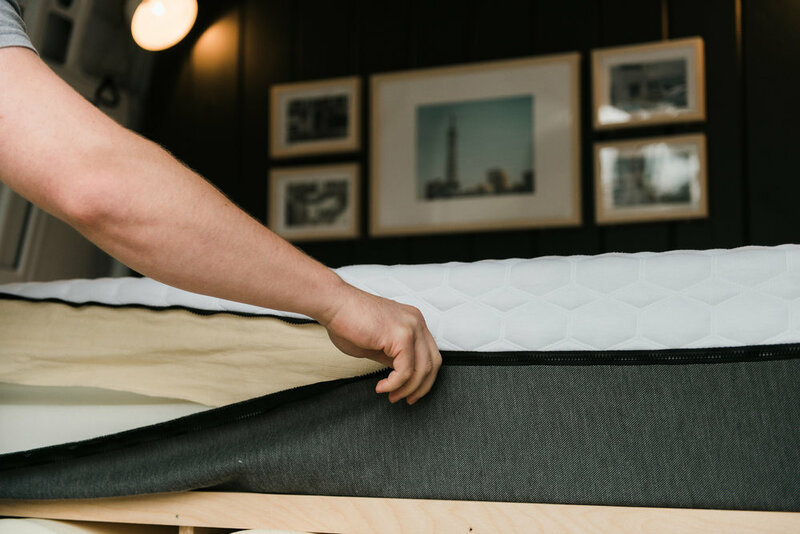 We don’t split the mattress on one side or another (for good reasons, which you can find in our FAQ), but rather the Comfort Test takes both individual’s results into account to create a bed that works ideally for both sleepers. Once the Comfort Test is completed, we start making the mattress that will work for you, right in front of you. Making Your Mattress, Not Just Selling Ours. As opposed to the traditional store experience, we make a mattress that’s based on your needs, rather than simply selling what we have. Now that we’ve customized a mattress based on your personal Comfort Test results, you can give it a try. Just What You Need, Right Where You Are. Forget the bed-in-a-box. Skip the storefront. 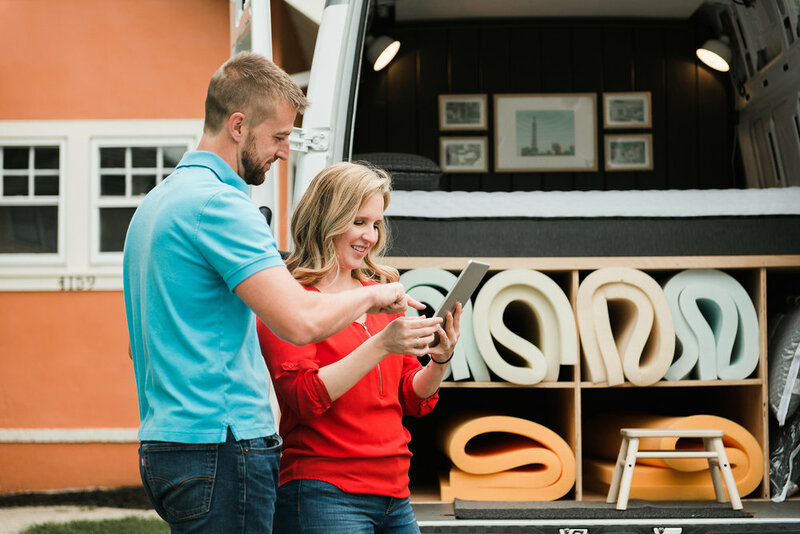 Our Store-to-Your-Door program provides you with the best of both worlds and a real solution for your sleep: a mattress you can test and purchase and the convenience of shopping without ever leaving your home. No Lead Time, No Waiting for a Delivery. 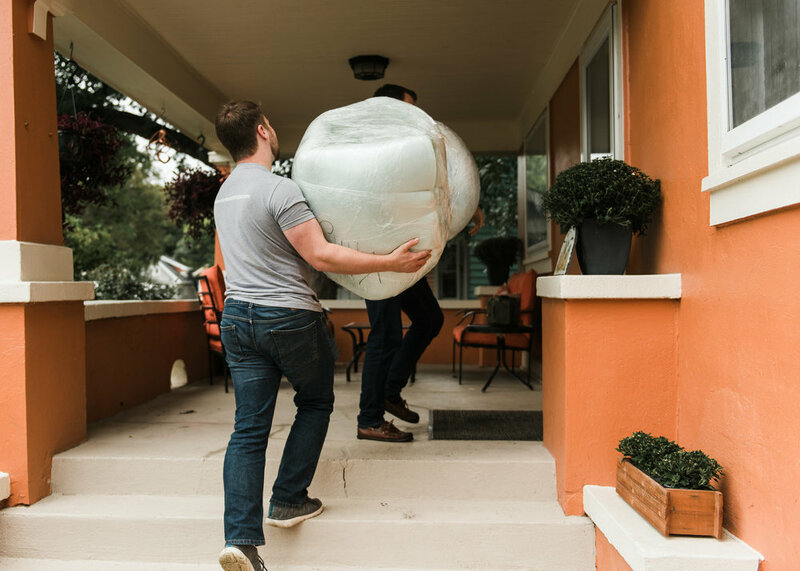 For regular purchases, Comfort Option provides free white glove delivery and, with a Store-to-Your-Door appointment, we’ll make the mattress right then and there. No FedEx deliveries or giant boxes on your front porch, no added cost or schedule alignments for delivery. Just what you need right away. If you’re ready to purchase, we’ll assemble your mattress, layer by layer, right where it needs to be. The only thing you have to do is lay down and relax when it’s finished. Since we make the mattresses ourselves, we don’t hide what’s inside. From the I-Beam core to each custom layer, you can take a look for yourself and know what you’re getting. No Glue, for a Couple Reasons. We don’t glue anything together. Why, you ask? First of all, it ensures you don’t have any hard lines inside the mattress, only comfort layers. Second, it allows us to customize over time - check out our 30/90 Comfort Commitment to see what we mean. With that, we’re out of your way and will leave you to enjoy all of the comfort of your individually-customized, freshly-constructed mattress. Ready to customize your sleep? Leaders in Foam Fabrication Since 1952.